Click on figures for larger images. Figure 1. 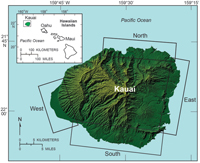 Map of Kauai showing shoreline study regions: north, east, south, west. Figure 2. Map of Oahu showing shoreline study regions: north, east, south, west. Figure 3. Map of Maui showing shoreline study regions: north, Kihei, west. Data in this report are available as downloadable files based on the 11 geomorphic regions within the Kauai (fig. 1), Oahu (fig. 2), and Maui (fig. 3) study areas. These index maps show the extent of each region. All vector data are delivered as ESRI shapefiles in the geographic coordinate system (WGS84) and distributed with Federal Geographic Data Committee- (FGDC) compliant metadata in Extensible Markup Language (*.xml) format. Tabular data are delivered as dBase IV (*.dbf) structured files, which can be read with ESRI ArcGIS software as well as many other available spreadsheet programs. Metadata are also provided for all spatial and tabular data in text (*.txt) and FGDC Classic (*.html) format. ESRI ArcCatalog 9.x can also be used to examine the metadata in a variety of additional formats. This report includes all of the files necessary to perform shoreline-change analyses using the Digital Shoreline Analysis System (DSAS) software. 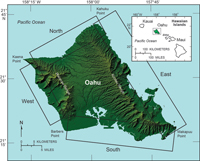 Please refer to Thieler and others (2009) for information about the DSAS software application that was used to perform the rate calculation, which are discussed at length in the detailed report, National Assessment of Shoreline Change: Historical Shoreline Change in the Hawaiian Islands (Fletcher and others, 2011). short-term transect file with rates. Data layers can be downloaded individually using the table below. Individual layers are provided as WinZip® files. If WinZip® is not currently installed on the local system, go to WinZip® (http://www.winzip.com) to download the most recent version.